Accurate, streamlined services for your precision machining needs. Our value-added services gives us the flexibility to respond to your unique needs. Integrating these services with our precision machining and manufacturing give you the ability to get what you need in one place. Enterprise Machining knows that a part is not complete without finishing. We work with qualified finishing suppliers to get your product finished hassle-free. Enterprise Machining is equipped with the experience, people and equipment to do light assembly work ranging from simple to complex. Because the assembled components are often mating with CNC machined parts that we manufacture, we have better control of part fit and assembly function. At Enterprise Machining we can get the precision welding portion of you order done. Whether the part is large or small we can help you control cost, quality and save you precious time on your order. At Enterprise Machining we help customers get the most for their casting development dollar. 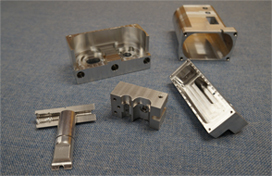 We are able to do this by offering interchangeable molds to our clients as a cost effective solution. Enterprise works with qualified casting suppliers to get your casting done efficiently with both small lot and medium capacity jobs.